Happy Monday! As promised, today I’m bringing you a delicious, spicy and yet slightly creamy recipe for turkey chili. And don’t worry – the pinto beans included in the ingredient list are supposed to be in there. It’s not a typo. Trust me, they are delicious and are also perfect for any bean-wary chili eaters in your family. Enjoy! Heat the olive oil in a large pot. Add turkey and cook until brown, breaking the pieces with a wooden spoon. Add garlic powder and paprika to the meat and cook for 1 minute. Add chicken stock, scraping the bottom the pan to incorporate all the seasonings. Add tomatoes, chili powder and pepper. Bring to boil and simmer 30 minutes. Add beans, simmer 10 minutes or until beans are heated through. Salt to taste. Serve with your favorite toppings! Next Post How To Keep The Kitchen Clean While You Bake! your pumpkin bowl is so cute and that chili sounds delicious!!.. I sometimes post my meals from last week too,depends on what I do. Thank you Diana! I love pulling those pumpkin bowls out every fall, they are so fun. 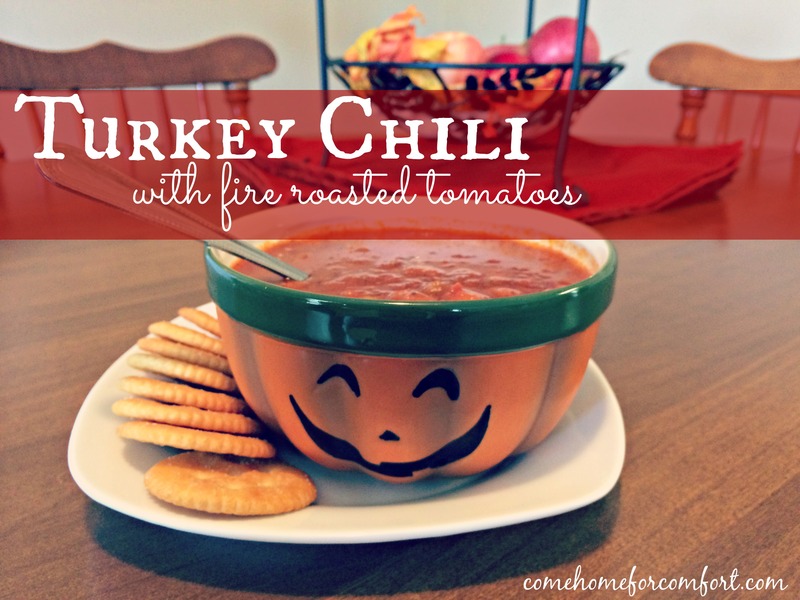 Turkey chilli sounds delicious, I think I’ll have to add this to my dinners this week. Such an easy but hearty meal. Thank you for sharing! Oh yay, I always hope to inspire someone with my menu. Thanks, Katie!